Upon logging in to Out of Eden Learn, students are greeted by a Google image of the earth. Red pins point to the locations of schools in a walking party; yellow markers indicate where Paul Salopek has been in his journey. The map neatly illustrates our co-existence, and the distances that can be bridged by virtual space. Yet the picture—and the larger project of Out of Eden Learn—also invites us to wonder. What happens when we zoom in? What if we looked at things from a different angle? Here we are introduced to a world that could never be captured by a Google image. Far from feeling familiar, it is filled with surprise. The local college and elementary school, sites that we might expect to be labeled in bold on an “official” map, do not receive special recognition. Instead, places such as the “lonely bus stop” and an “awesome-sauce friend’s house” are given distinction and emotional weight. The landscape is told with unforgettable elements of detail: ghosts haunting the outskirts, a train that crosses into “mystical/unexplored lands,” the question of mermaids to be found. It is a playful depiction of a neighborhood, and a fascinating glimpse into an individual’s experience of place. The student’s map and the subsequent exchange highlight some of the big picture ideas in Out of Eden Learn. First, it demonstrates how individuals view the world through their own unique lenses. Whether reflecting on mythical creatures, the conditions of a neighborhood, or the impact of technology on our lives, perceptions are important–and often different. We value the learning made possible through engaging our many realities, and seek to foster a community that recognizes multiple truths. 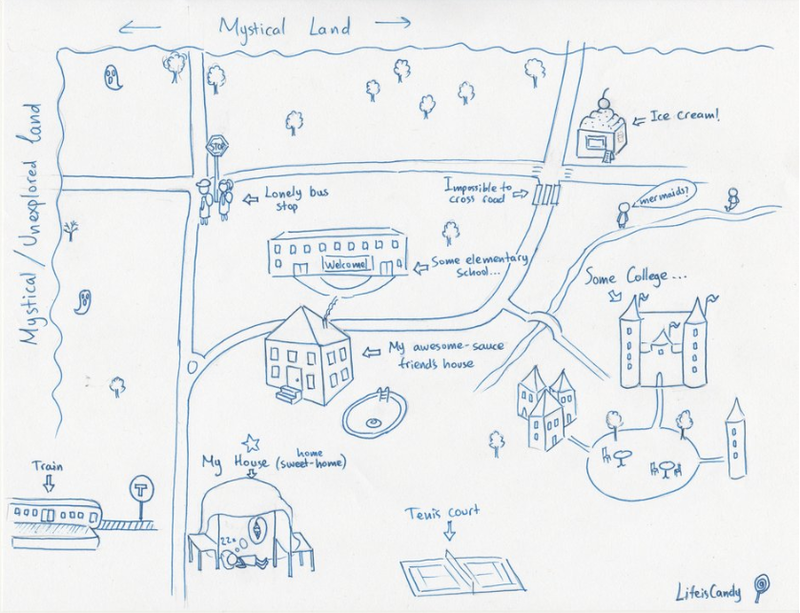 Furthermore, as shown by the squiggly lines around the edges of the student’s neighborhood map, the borders of our worlds are changeable. Exploring what lies outside of what’s familiar could lead us to reimagine the boundaries we’ve drawn in the past, or compel us to erase them all together. As we follow along with Paul Salopek’s journey, we may long for the thrill of travel to distant lands, to push the bounds of our understanding. Yet the students’ interaction here reminds us that we don’t have to set foot in a new environment in order to expand our minds. What we need is space for dialogue. Through Out of Eden Learn, we are attempting some first steps into dialogue, a process that Paulo Freire considers the humanizing work of naming the world in order to transform it. According to Freire, dialogue is based on respect for others’ perspectives, and on willingness to work together towards shared understandings of the world. As our project evolves, we are learning that “the world” is not a given. It is not something static that exists outside of us, teachable through a textbook. It is dynamic and emergent, constructed in the relations between us. For me, this signals our limits as individuals, and suggests our powers as a collective. Possibly, in collaboration with one another, we can generate knowledge that might otherwise lie beyond reach. In conversation, we can discover different ways to view objects, issues, places, communities. And in each colorful map and spirited exchange on our platform, we have an opportunity to see the world anew. An educator and philosopher born in Brazil, Paulo Freire (1921-1997) is known for his pioneering ideas on critical pedagogy, dialogue, and praxis. Information on Freire’s life and writings can be found on the website of the Freire Institute, http://www.freire.org/.